The Vucciria District is one of the oldest and most famous areas in all of Palermo. Officially, it is called Castellammare – La Loggia. Even though its history dates back thousands of years, Vucciria is still very much alive with its rich culture rooted in tradition. Where Venetian salesmen used to line the streets selling anything you can imagine, it is no wonder some of the streets still have names like Blacksmith’s Road (Via dei Chiavettieri) or Mattress Maker’s Road (Via dei Materassai). You might not want to hear this, but there are few signs of the once vibrant outdoor market that you might have read about somewhere else. You might find the occasional unappetizing or unappealing food vendor from time to time, but fortunately your tour plan doesn’t focus on a vibrant marketplace. 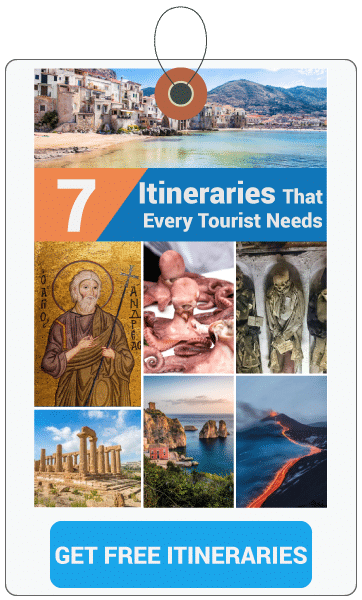 What you are going to be seeing a good deal of all morning will be the amazing churches along this itinerary, and you will get to experience some of the legendary nightlife Vucciria has to offer after the sun goes down. Perhaps before I get too detailed, I should just do a quick breakdown of the highlights of your upcoming walking tour. That way there are no big surprises when I get into more detail later. No matter your religious affiliations, you are going to be spending a good bit of your morning checking out some of the amazing churches and chapels that this district has to offer. Two major stops along these lines will be Santa Cita and San Domenico. While you might expect (from other things you might have read) to see the highly regarded old marketplace in this district, it is but a shell of what it used to be years ago. You can have a look at what it is today, but it will not likely be as impressive as what you might have built up in your head. Simple lunch stops are all over the district, but I recommend you stopping at Zia Pina or Freschette BioBistrot. After you’ve had your fill of lunch, you have a couple more important places that you really shouldn’t miss. The first of these will be the Regional Archaeological Museum Antonino Salinas and a Puppet Theater (owned by the Cuticchio Family) that is deemed the most beautiful in all of Palermo. Enjoy a nice aperitif at either the Champagneria or the Via dei Chiavettieri. You can certainly have a refreshing beer or two at night at the world famous Taverna Azzurra, but a word of caution: pickpockets tend to frequent the old market after the sun goes down. Keep your eyes peeled and your wits about you. Basically your entire morning is going to be spent in La Loggia, now known as the historical district of Castallammare. Within this small area, there are 5 stops that you need to see for yourself. These are architectural wonders and you will thank me later for all of the sights that you will see in the next couple of hours. The five must stop spots here are: San Giorgio dei Genovesi, the SS. Rosario in San Domenico, SS. Rosario in Santa Cita and S. Maria in Valverde. One thing that you will quickly pick up on through touring through this area is that it is very much geared to refined minds and art enthusiasts. If you are someone that is just in Palermo to party, and couldn’t care less about the art and culture here, this area would likely blow your mind (so it is best to avoid the quarter altogether). The partiers have their place here too, it is just coming back to the Vucciria Market once the sun goes down. Here you can drink wildly and dance the night away until the sun rises again on beautiful Palermo. Dating back to the 13th century, the district of Loggia was originally created through the efforts of the Pisan, Venetian and Genoese who built lodges, chapels and warehouses all throughout the region. This walking tour is going to take you through the deep rooted history of this district, making certain to have you see the often overlooked locations left out by less knowledgeable tour guide authors. The first stop on your walking itinerary would be the SS. Rosario Church in San Domenico square. This is located just outside of the Market area. When you enter, be sure to clear your mind of all the distractions. You don’t want anything to keep your mind from absorbing all that it is about to see. 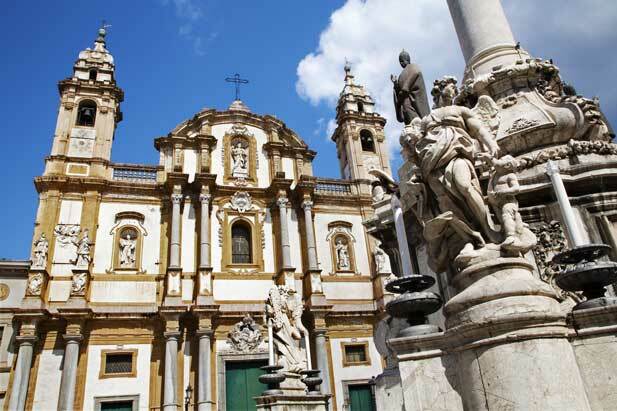 While this is the second largest sanctuary that you can find in all of Palermo, which is impressive enough as it is, you will also note that this is the final resting place of Giovanni Falcone. He was an Italian judge/prosecuting magistrate that famously fought against the ever present Mafia in Sicily. He represented the ideal that Sicily wanted change. You will find that there is a stark contrast between the interior and exterior of this impressive church. The ornate and intricately designed exterior is just breathtaking, capped off with the two impressive bell towers that the entire façade is seated in between. When you walk inside, you see the Dominican Order’s beliefs regarding their lifestyle, as there is little along the line of ornate decoration or awe-inspiring design. 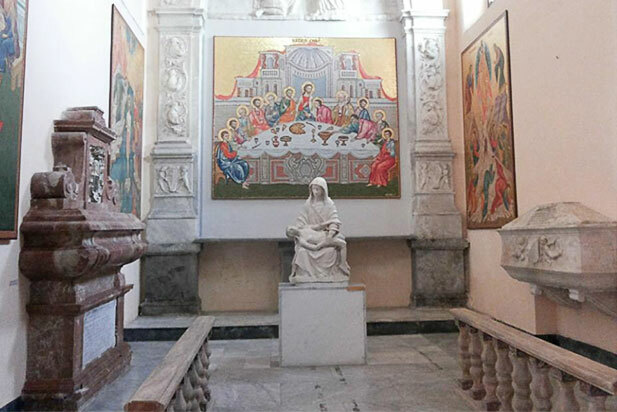 This beautiful next stop on your walking tour throughout Palermo’s Vucciria District has you appreciating the church that was dedicated to the patroness of housekeepers. An interesting fact is that this church was purchased by the Dominicans in the 11th century and permitted rich families to bury their loved ones among huge sums of money. You might even pass this church by if you were just judging it from the outside. There is a definite modesty to the decorations of the exterior to this church, but once inside you can appreciate a large number of treasures, of both historical and artistic significance. To put a point on how little known this church actually is, it is a mystery to a lot of the local Sicilians in the area. That in itself is a shame. Inside you will find classic works from Gagini and a side chapel that is intricately adorned with marble that can prove to be a draw in and of itself. During WWII, this church would fall victim to bombings and be majorly damaged. The aisles were lost when this happened, but the apse and transept remained intact. While the exterior might not be anything all that inspired, stepping through the threshold of the door is like walking into a dream. Giacomo Serpotta was an expert stucco artist and decorated the inside of this impressive building starting in 1688, and finally ending in 1718. While the entirety of his work is breathtaking, perhaps the most famous and intricate of his works inside is the “Battle of Lepanto.” This was a portrayal of the victory that Christians saw over the Turks in the Battle of Lepanto. While you can sit for hours soaking in the story, you should be warned that the impressive sculptures are so lifelike that they have been mistaken in the past for moving. You might walk by this church without giving it a second thought (like several other stops on this tour), but it is very advised that you walk inside and see all the décor. The entire interior of the church is a recap to Baroque artists of the time when it was constructed. There is only a single nave within the main portion of the church. However, both of the main side walls each feature chapel altars. Each of these are dedicated to different saints. One of the most impressive of these (if you only have time to see one) is Saint Lucia. This is on the right side of the main area. Apart from these altars to appreciate, you will find so much more just looking up and around the entire interior of this amazing building. There are colors and shapes all over, reminiscent of the Baroque era that reigned when the church was constructed. In addition, you will see sculptures, frescoes and paintings. Among the most magnificent of the artwork in S. Maria is the altarpiece entitled “Our Lady of Mount Carmel” by Pietro Novelli. You aren’t going to spend your entire day looking through San Giorgio dei Genovesi Church. Considering that you have already seen several churches just in this day trip alone, you might even be underwhelmed by building entirely. Of course, this church is still well worth a visit when you can appreciate a little bit of its history and significance. 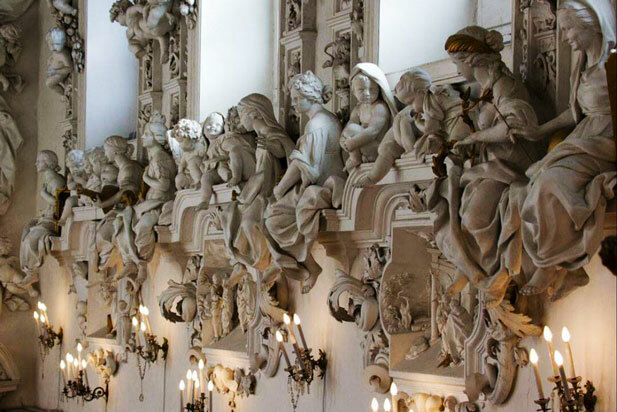 Unlike all of the baroque churches that you have already seen (or could see on your own apart from this itinerary), San Giorgio dei Genovesi is fairly bare in terms of statues, and stucco sculptures. What you will find inside is a trove of important 17th century paintings. Among the artists that have works commissioned from this church are Jacopo da Empoli, Gerardo Astorino, Luca Giordano, Jacopo Palma, Filippo Paladini and Bernardo Castello. 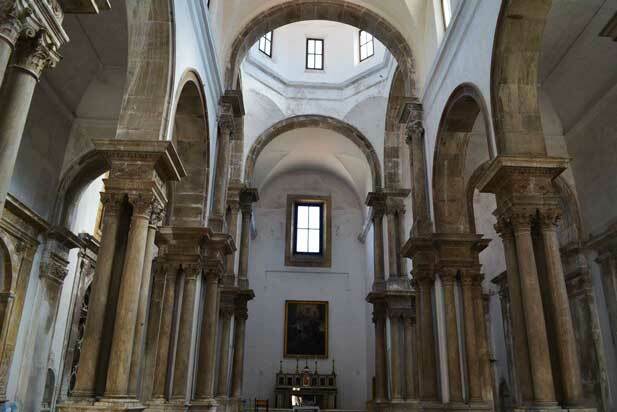 The church itself was founded in the later half of the 1500s by a modest group of Genoese merchants residing in Palermo. 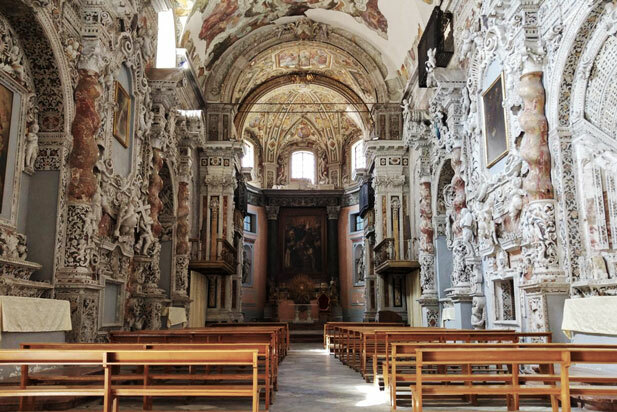 To give you an idea about the economic influence of the Genoese at the time, this church was constructed with a Renaissance façade and loaded up its interior with priceless paintings. This former house of worship is little more than a space to showcase its lasting beauty these days. Down to the marble flooring speckled with gravestones, this is a wondrous sight. Behind this church lies the Tredici Vittime Square which has two obelisks: one to commemorate the fallen during the 1860 uprising and another to remember the victims of the mafia. Hopefully you aren’t running out of amazed faces yet, as this next stop is going to require a few surprised faces before you have seen it all. Now that you have seen several of the prominent churches in the region and their splendor, it is time to appreciate some history at the museum. You might not know that this entire facility is dedicated to the famous Palermo Antonio Salinas, world renowned archaeologist and numismatist. 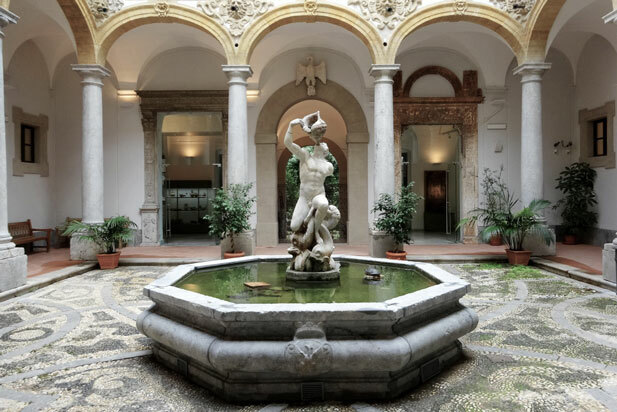 Here you will find the home of the most extensive collection of Greek and Punic art in all of Italy. The building itself dates back to the 16th century, and is considered to be part of the Olivella Complex which also houses the Church of St. Ignatius and the Oratory. As it stands today, the exhibitions of the museum are greatly reduced due to renovations throughout the building. While I have been swearing up a storm at this travesty, I suppose they aren’t speeding up the process at all. But it is still well worth the trip for what there is to still see. There are many outstanding art collections here, and a stroll through the rooms here is a virtual stroll through the golden years of this fair island. 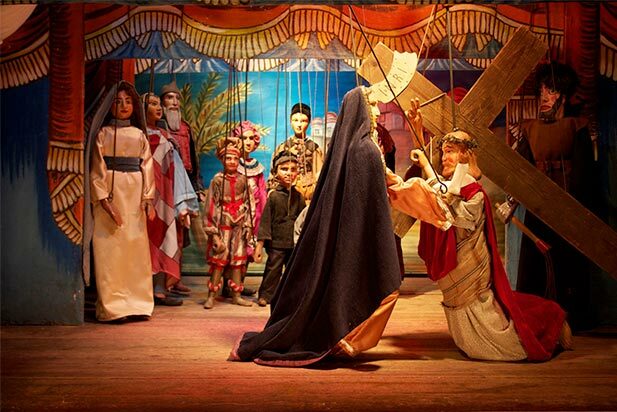 No one leaves there without a deeper appreciation for the history and customs of the Sicilians. There are an impressive 10,394 pieces on display throughout the museum, many of which have huge historical significance. 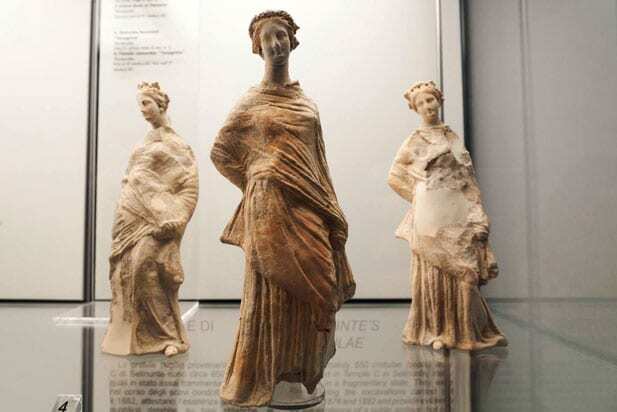 Among the artifacts are ancient objects recovered from the mainland and Sicilian seabed, which are on display among impressive artifacts from places like Egypt and Greece. As I said no one can remain ignorant to the history of the Sicilians and their customs once they have left, and things like the Palermo Stone are a big part of that fact. This is dated back to 3000 B.C. It is recommended to call or email them prior to your visit to ensure seating for a viewing. People of all ages will love and appreciate this ancient offering from the Vucciria District. Who doesn’t love some puppets, right? This electrifying and impressive show showcases the art and culture that people know Sicily for. There is something both modern and classical about this production, and it all blends itself to life before your eyes in this small theater, the Opera dei Pupi (owned by the famous Cuticchio Family). 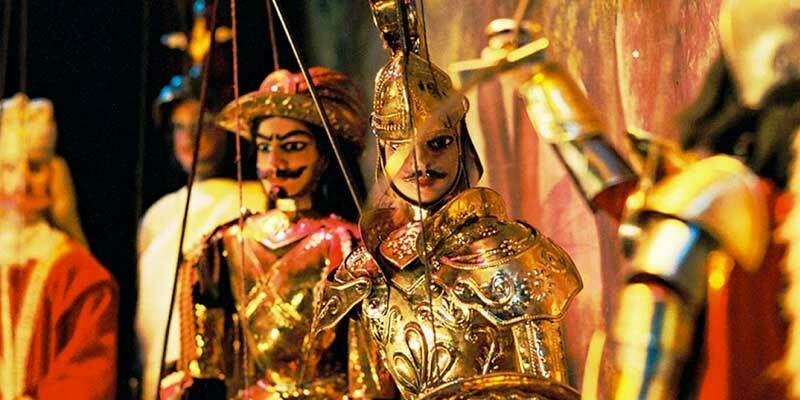 Just like they always have been, today the puppets are adorned with shiny armor and swords waiting to greet fascinated onlookers. This is an important stop to make, because it truly is a remarkable show that you won’t want to miss. The Vucciria Market comes to life when the sun goes down, and offers an escape from the rules and conventional choices of daytime life here. You will find all manner of people indulging in the dancing and drinking, from unpretentious people to the young would-be criminal. You might be risking the cash in your pocket, but there is no nightlife quite like the one you’ll find among the crumbling buildings in the Garraffello Square. I’ve made some walking tours for Capo, Kalsa and Albergheria Districts (which you should be checking out too if you haven’t yet). If you’ve followed these in order, than now you have seen the whole town and you didn’t need to rely on the shoddy public transportation system of the city in order to do it either. Any questions or comments on this or any of the tours, feel free to comment below and I will be happy to lend a hand.